It might seem early to be talking about it, but for those looking to buy high-ticket goods, you'll want to know whether you need to wait for the Black Friday rush to pick up the right bargain. John Lewis is famously “never knowingly undersold”, and that means it’s a good place to look for Black Friday bargains: you get all the discounts without sacrificing that famous customer service and its long warranties on products. The standard John Lewis guarantee is two years on most products, but that jumps up to five years on TVs. Last year John Lewis' Black Friday deals helped the brand smash its sales records. Black Friday was its biggest ever week, with sales up 7.7% year-on-year. It wasn’t just technology – one of the biggest sellers was Creed Aventus perfume, which is £170 a bottle – but electrical and homewares were up 6%. Apple AirPods, Google Home Minis and Amazon Echos were particularly hot products. When will there be John Lewis Black Friday deals in 2019? 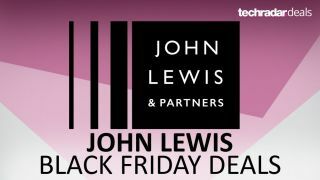 Black Friday falls on November 29, 2019, but like many other retailers John Lewis likes to start its deals in advance. In 2018, it began offering deals the weekend before Black Friday and into the week afterwards. If 2018 was any indication, John Lewis’ Black Friday is going to be a store-wide event. For example, in addition to stacks of TV, iPad and laptop deals – more of them in a moment – you could get 20% off the Anki Vector robot, which featured on many letters to Santa last year. There was £120 off a set of Bose QuietComfort 20s, dropping the price from £249 to £129, and the bigger, more luxurious QuietComfort 35 II headphones were down from £329 to £289. Given we've not seen anything in terms of an upgrade on these headphones so far this year, we're expecting that price to drop even further this year. We're thinking that the popular SIM-free phones are going to be big hitters again this year. John Lewis had lots of solid phone deals including £30 off the iPhone XR, £200 off the Huawei P20 (and £170 off the Huawei P20 Pro), £40 off the Google Pixel 3 and £170 off the Samsung Galaxy S9 64GB, down to £569 from the previous price of £739. There was £50 off the Honor 9 Lite, £30 off the Huawei P Smart and £20 off both the Moto G6 Play and Nokia 3.1, making those budget models even more affordable. We saw some good deals on cameras too, which is another category you might want to keep an eye on this year to pick up a bargain. The combination of a £290 discount and £250 cashback brought the price of a Panasonic Lumix G9 down to £1,049, while £185 off the Nikon D500 brought its price down to £1,514 – at the time, the best price we’d seen for Nikon’s flagship DX-format DSLR. Compact cameras came with lower prices too: The Panasonic Lumix FT7 dropped £100 to £299, and the Nikon Coolpix B500 bridge camera dropped from £237 to £199. Last but not least there were deals on smart home and wearable tech - the smart home in particular is set to be big this year and see some fairly meaty John Lewis deals. Apple’s HomePod dropped from £319 to £279, a record low price for Apple’s impressive and expensive home speaker, while the Sonos One also got a cut: down to £164 from £189, offering an Alexa-powered, more affordable alternative to Apple’s smart speaker. On the wearable front, or perhaps the wearable wrist, there was £35 off the Garmin Fenix 5 smartwatch. Lots of people buy their TVs from John Lewis because of that five-year guarantee, so when it starts discounting models for Black Friday deals they become even more attractive. John Lewis sells a lot of luxury items and TVs are no exception, so if you fancy £600 off a high-end Samsung this Black Friday it’s definitely worth a bookmark: that’s how much John Lewis took off Samsung’s 'quantum dot' Q8F 65-inch QLED TV last year, taking it from £2,699 to £2,099. There were some decent discounts on slightly smaller (but still massive) TVs too. Last year saw £200 off a Sony Bravia OLED 4K 55-inch, £200 off a 55-inch Panasonic OLED HDR 4K TV, and £180 off a 55-inch LG OLED. Other retailers may offer slightly better discounts on similar sets but don’t forget that warranty. Black Friday 2018 saw John Lewis discount iPads, but don’t get too excited: while £20 off the Apple iPad 9.7 (2018) is nice enough, you’re not saving enough to buy a half-decent case, let alone something like an Apple Pencil. But if you were planning to buy a half-decent case too then the savings started to materialise last year: Logitech’s Slim Folio Keyboard for iPad, which we think is brilliant, was down from £90 to £42.50 – so if you were planning to buy an iPad and a keyboard case you’d be just under £70 better off. In 2019 we think we’ll see very similar deals, with just a little off the top of an ordinary iPad but more substantial discounts on good quality accessories. If you’ve been holding off on your next iPad purchase or if Santa has been waiting to get one for someone in the household, you could well pick up a bargain bundle on Black Friday 2019 - or you can just bite the bullet now and have a decent tablet for a few months more if saving a few pounds isn't worth the hassle. John Lewis doesn’t stock as many different laptop models as some other retailers, but the discounts it offers are decent and the range runs from pro-level powerhouses to cheap and cheerful Chromebooks. Last year we saw John Lewis take £100 off Microsoft’s Surface Book 2, dropping the price to £1,099; £250 off the Acer Swift 5 Intel Core i7, bringing it down from £1,099 to £849; £150 off the impressive Asus ROG Zephyrus gaming laptop, down to £1,599.95; and £100 off the cute and capable Asus Chromebook C302ca, down from £499.95 to £399. John Lewis prides itself on its “never knowingly undersold” policy, but that doesn’t include delivery – so it’s worth looking at competitors to see if you can get the same thing at the same price with free delivery thrown in. You probably won’t for smaller items (unless it’s Amazon and you’re a Prime member) but it’s worth a look for bulkier purchases. While John Lewis will match competitors’ prices on Black Friday, the items must be identical – so if a TV looks identical but its model is 1234ABC and the John Lewis one is 1234DEF, the price match won’t apply. We will scour all John Lewis' Black Friday and Cyber Monday deals on your behalf, with the aid of serious amounts of caffeine, and we'll tell you whether the deals are worth getting excited about and which you can ignore. For up to the minute info, breaking deals and the biggest savings as soon as we know about them, make sure you follow TR Deals on Twitter so you don't miss out on any hot Cyber Monday deals from John Lewis.